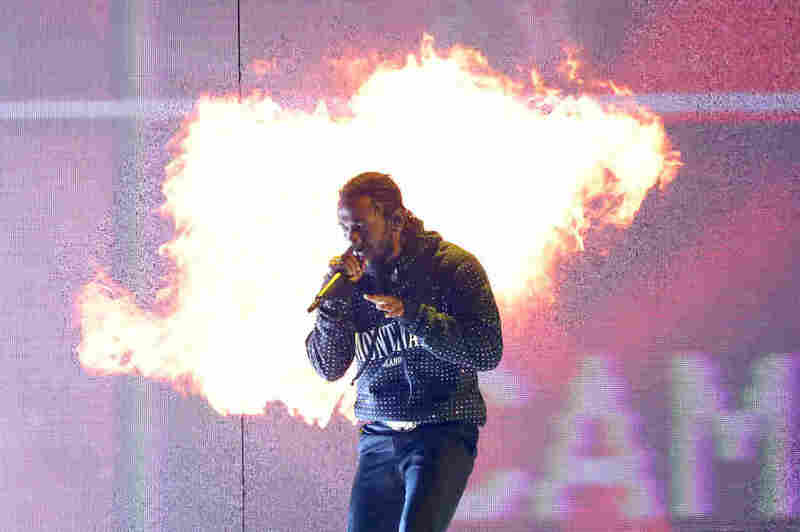 Pulitzer Prize Winners Include Kendrick Lamar, 'Washington Post,' And 'New Yorker' : The Two-Way Lamar joins the staffs of The New York Times and The Washington Post as this year's prize winners. See the list of winners and watch Monday's announcement ceremony here. Out of more than 2,400 submissions, distinguished projects in just 21 categories earned gold Monday as winners of the 2018 Pulitzer Prizes. "They include books, music and drama that inform us, that challenge our conventional notions of creative expression and that push us to consider and embrace new ideas and perspectives," Pulitzer administrator Dana Canedy said during the announcement at Columbia University in New York City. "In the journalism categories, yet again this year, winners uphold the highest purpose of a free and independent press," she added. "Even in the most trying of times, these courageous inspiring and committed journalists and their news organizations are undaunted in their mission in support of the Fourth Estate." Among the winners are photographers and investigators, commentators and cartoonists, authors and scholars. Watch the announcement at the link above, and find the winners — together with judges' explanation about why they won — in the list below. Kendrick Lamar, whose album DAMN. won this year's Pulitzer Prize for music, performs in London earlier this year. Public Service: jointly awarded to The New York Times, for reporting led by Jodi Kantor and Megan Twohey, and The New Yorker, for reporting by Ronan Farrow. "For explosive, impactful journalism that exposed powerful and wealthy sexual predators — including allegations against one of Hollywood's most influential producers — bringing them to account for long-suppressed claims of coercion, brutality and victim-silencing, thus spurring a worldwide reckoning about sexual abuse of women." Breaking News Reporting: The staff of the Santa Rosa Press Democrat. "For lucid and tenacious coverage of historic wildfires that ravaged the city of Santa Rosa and Sonoma County, and for expertly utilizing an array of tools, including photography, video and social media platforms to bring clarity to its readers in real time and in subsequent in-depth reporting for investigative reporting." Investigative Reporting: The staff of The Washington Post. "For purposeful and relentless reporting that changed the course of a Senate race in Alabama, revealing a candidate's alleged past sexual harassment of teenage girls and subsequent efforts to undermine the journalism that exposed it." Explanatory Reporting: Jointly awarded to the staffs of the Arizona Republic and the USA Today Network. "For vivid and timely reporting that masterfully combined text, video, podcasts and virtual reality to examine from multiple perspectives the difficulties and unintended consequences of fulfilling President Trump's pledge to construct a wall along the U.S. border with Mexico." Local Reporting: The staff of the Cincinnati Enquirer. "For a riveting and insightful narrative and video documenting seven days of greater Cincinnati's heroin epidemic revealing how the deadly addiction has ravaged families and communities." National Reporting: Jointly awarded to the staffs of The New York Times and The Washington Post. "For deeply sourced, relentlessly reported coverage in the public interest that dramatically furthered the nation's understanding of Russian interference in the 2016 election and its connections to the Trump campaign. The president-elect's transition team and his eventual administration." International Reporting: Claire Baldwin, Andrew R.C. Marshall and Manuel Mogato of Reuters. "For relentless reporting that exposed the brutal killing campaign behind Philippine President Rodrigo Duterte's war on drugs." Feature Writing: Rachel Kaadzi Ghansah for GQ. "For an unforgettable portrait of murderer Dylann Roof, using a unique and powerful mix of reportage, first-person reflection and analysis of historical and cultural forces behind his killing of nine people inside Emanuel AME Church in Charleston, S.C."
Commentary: John Archibald of the Alabama Media Group. "For lyrical and courageous commentary that is rooted in Alabama but has a national resonance, in scrutinizing corrupt politicians, championing the rights of women and calling out hypocrisy for criticism." Criticism: Jerry Saltz of New York Magazine. "For a robust body of work that conveyed a canny and often daring perspective on visual arts in America, encompassing the personal, the political, the pure and the profane." Editorial Writing: Andie Dominick of The Des Moines Register. "For examining in a clear, indignant voice free of cliché or sentimentality, the damaging consequences for poor Iowa residents of privatizing the state's administration of Medicaid." Editorial Cartooning: Jake Halpern and Michael Sloan for The New York Times. "For an emotionally powerful series told in graphic narrative form that chronicled the daily struggles of a real-life family of refugees and its fear of deportation." Breaking News Photography: Ryan Kelly of The Daily Progress in Charlottesville, Va.
"For a chilling image that reflected the photographer's reflexes and concentration, in capturing the moment of impact of a car during a racially charged protests in Charlottesville, Va."
Feature Photography: The photography staff of Reuters. "For shocking photos that expose the world to the violence Rohingya refugees face in fleeing Myanmar." Fiction: Less, Andrew Sean Greer. "For a generous book, musical in its prose and expansive in its structure and range, about growing older and the essential nature of love." Drama: Cost of Living, by Martyna Majok. "An honest, original work that invites audiences to examine diverse perspectives of privilege and human connection through two pairs of mismatched individuals: a former trucker and his recently paralyzed ex-wife, and an arrogant young man with cerebral palsy and his new caregiver." History: The Gulf: The Making of an American Sea, by Jack E. Davis. "An important environmental history of the Gulf of Mexico that brings critical attention to the Earth's 10th largest body of water and one of the planet's most diverse and productive marine ecosystems." Biography: Prairie Fires: The American Dreams of Laura Ingalls Wilder, by Caroline Fraser. "A deeply resourced and elegantly written portrait of Laura Ingalls Wilder, author of The Little House on the Prairie series, that describes how Wilder transfers transformed her family's story of poverty, failure and struggle into an uplifting tale of self-reliance, familial love and perseverance." Poetry: Half-light, by Frank Bidart. "A volume of unyielding ambition and remarkable scope that mixes long, dramatic poems with short, elliptical lyrics, building on classical mythology and reinventing forms of desire that defy societal norms." General Nonfiction: Locking Up Our Own: Crime and Punishment in Black America, by James Forman Jr.
"An examination of the historical roots of contemporary criminal justice in the United States, based on vast experience and deep knowledge of the legal system, and its often devastating consequences for citizens and communities of color." Music: DAMN., by Kendrick Lamar. "A virtuosic song collection unified by its vernacular authenticity and rhythmic dynamism that offers affecting vignettes capturing the complexity of modern African-American life."